Just because you go into a game expecting to lose it doesn’t mean you are better prepared for actually losing, especially when the game could have easily swung the other direction. Not giving up the kick-off return for touchdown, not calling a shotgun run in the end zone in the final minutes of the game when only down by a field goal, not really selling the fake spike trick play on offense and then being burned twice on defense when the opposing team goes for the same bait-and-switch. Sfincione first popped up on my radar ages ago when Emeril still had a decent cooking show and wasn’t a cartoon character, but I never quite nailed the recipe until recently. 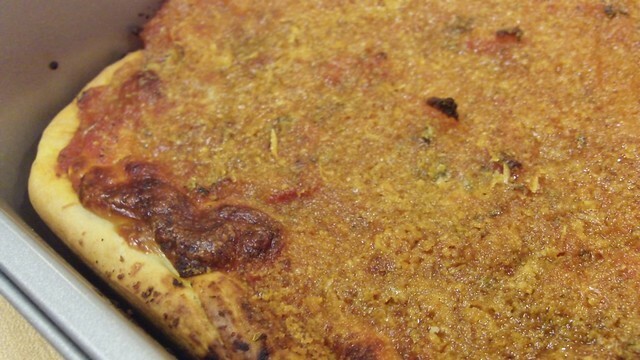 Traditional sfincione, not the ingredient-heavy bread Emeril pushes, is a special Sicilian pizza made for Christmas Eve and New Year’s Eve, with a very soft crust — sfincione meaning “sponge” — with simple toppings of tomatoes, sauteed onions, olive oil, oregano and breadcrumbs, and maybe anchovies and cheese if you like, but I’ve certainly seen enough sfincione recipes that omit either one or both. After lots of lots of research, trial and error, and watching Silician Nonnas on YouTube, the sfincione recipe I’ve had the best success with comes from L&B’s Spumoni Gardens in Brooklyn, as posted by the Morris County New Jersey Daily Record. 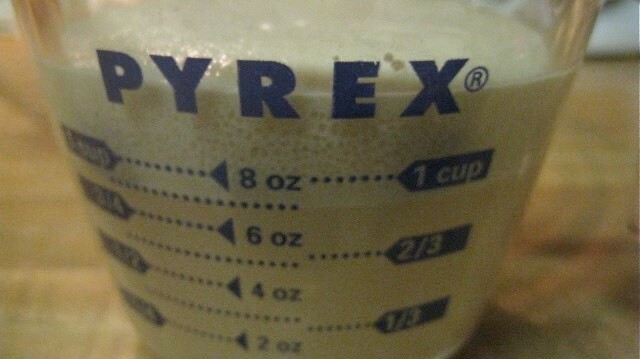 It’s much easier to make than you think it will be — don’t be afraid of using yeast! — and despite the rising times for the dough, is easy enough to make during the early games if you plan on serving it at the afternoon or evening match-ups. (Despite having a pipe burst in my kitchen yesterday morning, I was able to clean up the mess and make a sficione with time to spare before the Steelers 1:15 PT kickoff, it’s that easy.) 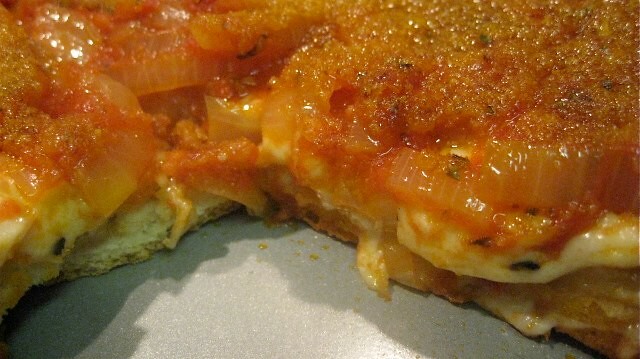 The lightness of the crust – even lighter than some focaccias, with the tang of tomatoes, the chewiness of the mozzarella and the crunch of the bread crumbs is a nice and inexpensive break from the usual take out pizza pie. 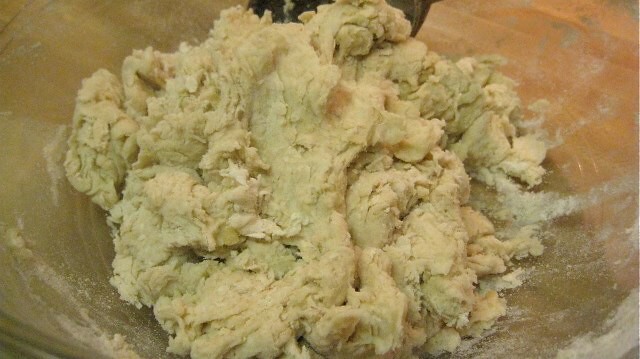 1/4 cup olive oil, plus extra for coating dough and oiling your baking pan. This particular sfincione was baked in a 11 1/2 x 15 1/2 inch deep lasagna pan, but I have seen recommendations for 13 x 18 inch pans or 12 x 16 pans, both of which are hard to find outside of specialty stores. Work with whatever large pans you have, but be sure they are are least two inches deep. I’ve seen a lot of “foodie” blogs suggest using panko crumbs instead of bread crumbs. I take a rather dim view of foregoing perfectly good, traditional ingredients for expensive alternatives, especially when the difference in texture will be completely lost between cheese and sauce, but if you are one of those types of cooks, then by all means, use panko. I hope you’re enjoying your luxury box seats during home games too. Stir one teaspoon of sugar and one packet of active dry yeast in 1 cup of 110º water and let sit for ten minutes to start their magic. While that’s going, mix together the salt and flour in a large bowl and make a well in the center of the dry ingredients to pour in the liquids. 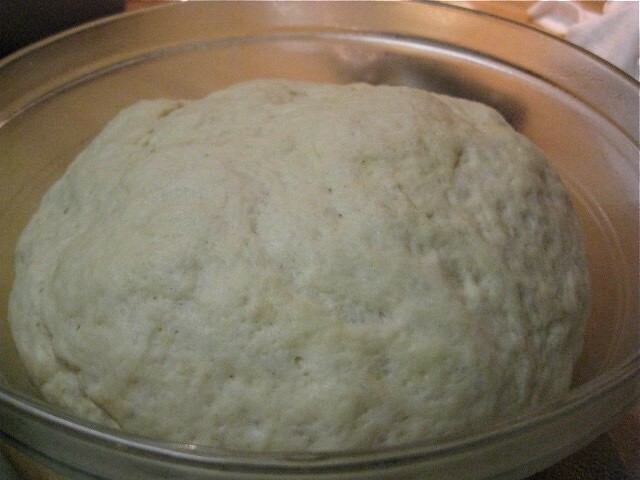 After the yeast is activated and ten minutes has passed, stir in 1/4 cup (2 ounces) of olive oil in to the water, sugar and yeast mixture and then combine it with the flour in and salt. 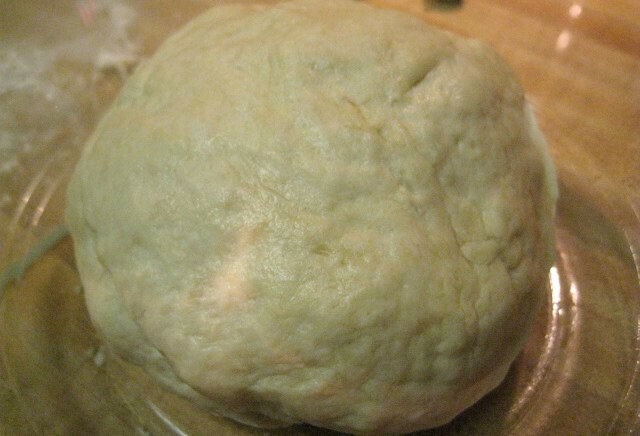 Once the dough comes together, kneed it on a lightly floured board until smooth and then form it into a ball. Using your hands and a touch of olive oil, lightly oil the ball all the way around. Lightly coat a medium bowl with olive oil, place the dough in the center and cover with a warm, damp kitchen towel for an about an hour. While the dough is rising, heat up 3/4 of a cup of olive oil over low heat in a large pan and cook your onions until translucent but not caramelized, about 15-20 minutes. Once ready, add in the crushed tomatoes, sugar, 1 teaspoon of oregano (crush it between your fingers to release the oils), salt and pepper and cook for about another five minutes. 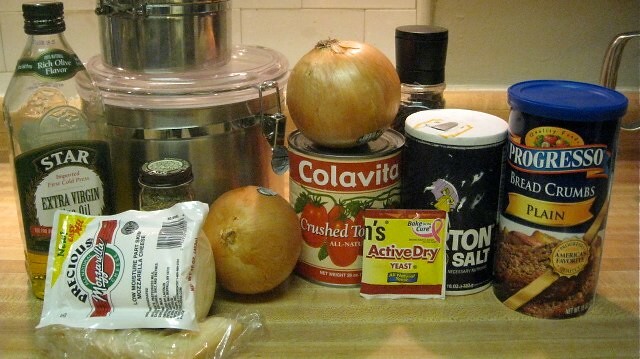 It may seem a little oily, but the more you stir the more olive oil and tomatoes will balance themselves out. Look! Magic! It’s all puffy like Rex Ryan or Santa Claus! 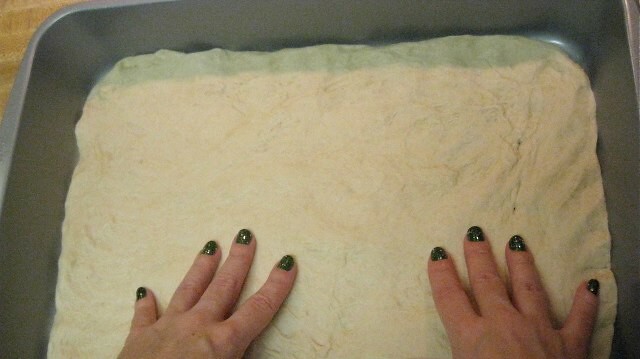 Deflate the dough and spread in a lightly oiled deep pan, using your fingers to even it out. If you’re using anchovies, sprinkle them across the bottom then cover the dough with the sliced mozzarella. 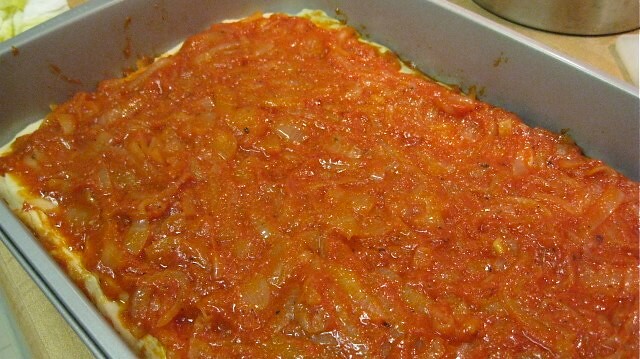 Evenly spread the cooled tomato and onion sauce over the mozzarella, leaving about 1/2 of an inch all the way around from the edge of the crust. 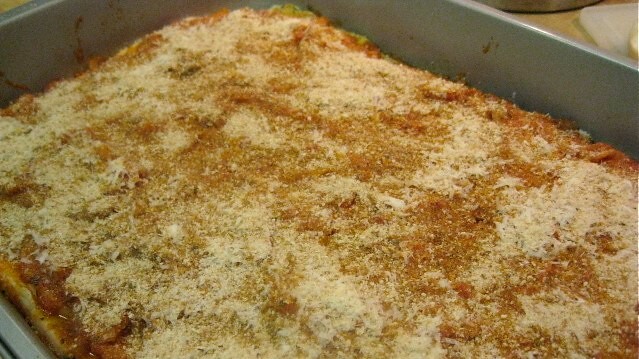 Top with the rest of the oregano, the Pecorino Romano or Parmesan cheese and finally, the bread crumbs. Let the dough rise again for 30 minutes. Heat the oven to 400º during this time. After the dough has risen again, (which seems more Easter-ish than Christmas-ish), bake at 400º for 25-30 minutes. 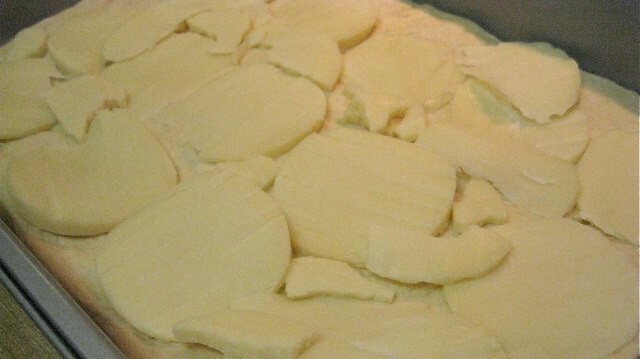 The crust should be golden brown around the edges and pulled slightly away from the the pan. 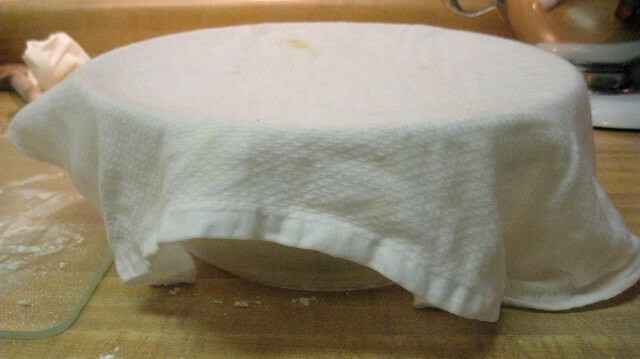 Let the pie rest for about ten to fifteen minutes before slicing and serving. 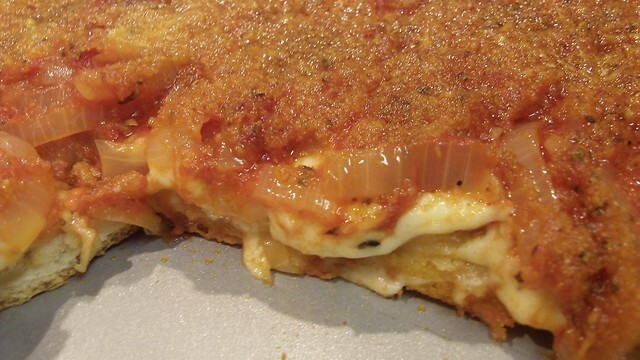 The soft crust, the melted cheese under the sauce and onions, with the extra crunch of the bread crumbs make for one of the better pizzas you can imagine. Easy enough to whip up for any game or party with little effort. And to be honest, if you have any leftovers, I almost prefer the sfincione after it’s been reheated in a 350º oven for about ten minutes. The bottom of the crust gets even more crunchy while maintaining the soft middle — SORT OF THE LIKE THE STEELERS SPECIAL TEAMS UNIT — while the sauce develops nicely. Merry Christmas football and food loving friends! Don’t forget to add your pictures to Football Foodies Flickr Group from last weekend and be sure to get some new shots this weekend. ~ by Sarah Sprague on December 20, 2010. Gorgeous! My dad would love this. His favorite pizza place in the world makes pizza like this, with the cheese under the sauce. I love the cheese under the sauce. Keeps it from drying out and getting stringy. "TheStarterWife" is the nome de plume for writer and rambler, Sarah Sprague. Taken from the title of a Gigi Levangie Grazer novel, "TheStarterWife" ended up having a much bigger online presence than Sarah ever expected thanks to Ladies... and too much time spent on various Gawker Media sites. Pssssttt – The Friday Football Foodie has moved! A post where someone travels back in time four months to tell themselves how their supposedly “great draft” went in the future.